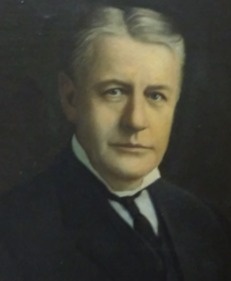 JAMES L. AUTRY II, general attorney of the Texas Company (later know as Texaco) and well-known member of the Texas bar, was born in Mississippi. His parents came from Alabama and Tennessee and his grandparents from Virginia, Maryland and North Carolina. His father, ﻿﻿James L. Autry I﻿﻿, was also a lawyer and commanded a Mississippi regiment in the Civil War, losing his life in, the service of the Confederacy at the battle of Murfreesboro, Tennessee. His grandfather, Micajah Autry, came to Texas in 1836, and lost his life in the historic fight at the Alamo. His name is on the Alamo monument at Austin. Mr. Autry was educated at Sewanee University and was admitted to the bar in Texas in 1881, and until 1904 was engaged in the practice of law in Corsicana. 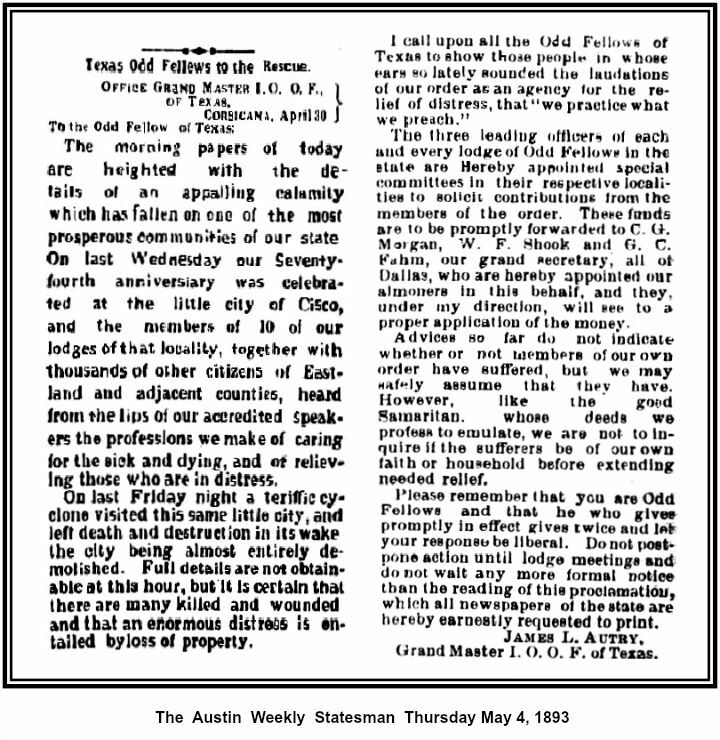 From that city he removed to Beaumont, coming thence to Houston in 1907. 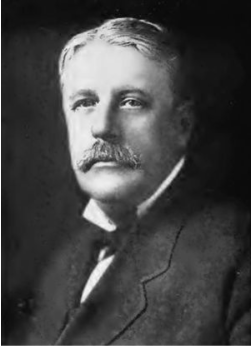 Has been general attorney of the Texas Company since its organization in 1902, and was one of its organizers. He belongs to the following clubs: Houston, Thalian, Houston Country, Oleander Country and Houston Launch Club. Also director in Houston Chamber of Commerce and vestryman of Christ Church. In 1896 at Corsicana, Texas, he married Miss Allie Kinsloe. They have two children, James L. Autry Jr. and Alice May Autry. James Lockhart Autry II was born in Holly Springs, Mississippi, on November 4, 1859. 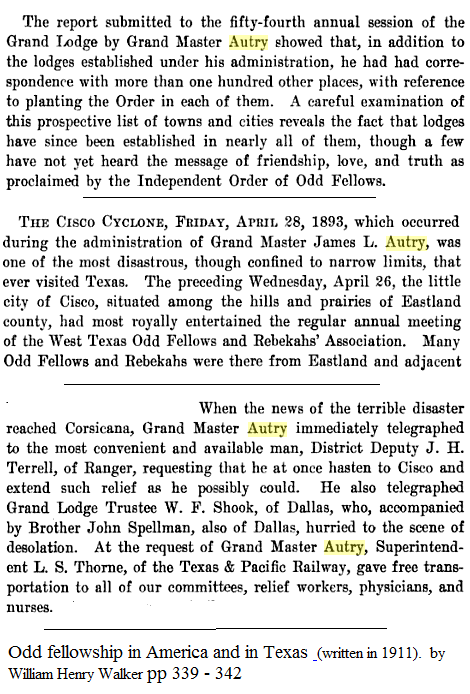 Educated in Mississippi schools for most of his life, Autry attended the University of the South on a scholarship before moving to Texas in 1876. He moved to Navarro County to undertake management of a ranch given to his grandfather's heirs for his part in the Texas Revolution. The wife of James L. Autry wanted to build a memorial to her late husband. 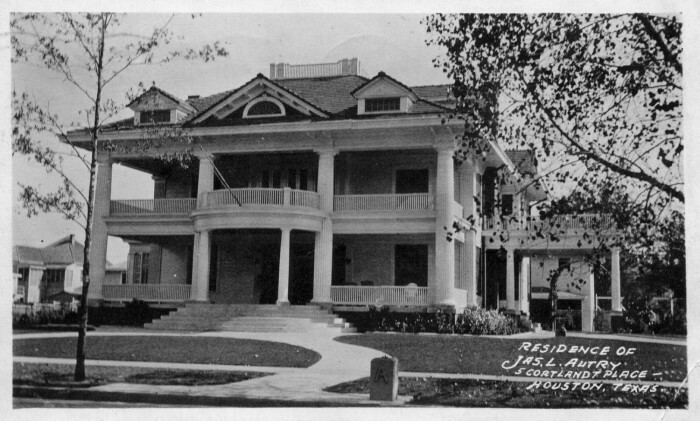 In 1921 she had the Autry House built across the street from the Rice University campus. Prior to that time there had been a temporary community center structure for the students to gather but it was nothing more than a shack. The idea of a recreation and religious center was conceived by her son James L. Autry Jr., who was a Rice University student at the time. He actually laid the cornerstone of the building. Unfortunately, he died at age 23 of appendicitis a year later after receiving his degree. 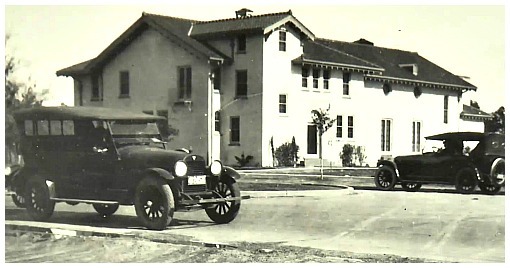 Mrs. Autry built the Autry Memorial School and a Houston hospital as a memorial to her late son. 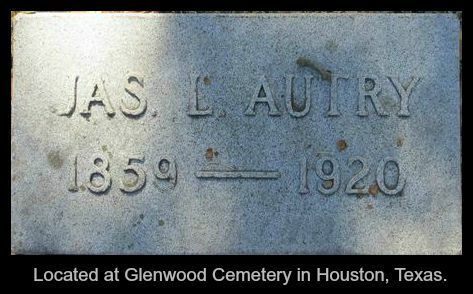 Mrs. Autry passed away in 1935.